A leading Welsh leave campaigner has criticised the PM for blaming MPs for her Brexit deal not passing in the House of Commons. David Jones spoke after the Prime Minister said it was "high-time" politicians made a decision. Mr Jones said the comments were disappointing to his colleagues. Plaid Cymru's Liz Saville Roberts said it was "deeply depressing" for the PM to put the blame on Members of Parliament. The UK is set to leave the European Union on the 29 March. The Commons has twice refused to pass her deal. On Wednesday, Mrs May wrote to EU Council President Donald Tusk requesting to delay Brexit until 30 June. Mr Tusk said the EU will only agree to a short delay to Brexit if MPs approve the current withdrawal agreement. The prime minister later said the public was "tired of infighting and political games". Conservative MP for Clwyd West David Jones, who has voted against the deal, said: "It's very clear from speaking to colleagues that nothing has changed today. "If anything, MPs have been irritated by the hectoring tones of Donald Tusk and the EU's intransigence. "They are also disappointed that the PM sought to put the blame on MPs for there being no agreement, when the fact is that the deal is disliked by parliamentarians of all colours, whether Leave or Remain". Image caption Liz Saville-Roberts said Theresa May had been "unable to imagine going beyond anything save her own deal"
Plaid Cymru's Liz Saville Roberts met the PM on Wednesday with other Westminster opposition leaders. Speaking on the BBC's News Channel, the Plaid Cymru MP said it was "deeply depressing" that the Prime Minister was blaming MPs for the situation. 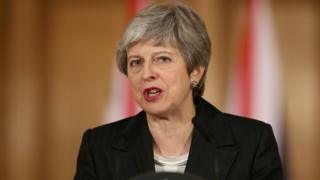 She added: "The Prime Minister talks about division and trying to heal that, but when she's not prepared to listen it's not surprising that we're in the position we're in". In the meeting Mrs May appeared "to be unable to imagine going beyond anything save her own deal", Ms Saville-Roberts said. She called for Parliament to sit in "continuous session until it can reach a decision and set out a clear plan". In reaction to the PM's statement, Welsh Brexit minister Jeremy Miles said: "Theresa May's capacity to underwhelm is absolute."